Boaters, fishermen. rowers, swimmers don't like to lose their keys at sea. It's can be problematic for anyone who spends a lot of time on the water. Floating key chains are made of foam polyurethane, giving the foam key chain natural buoyancy in water. 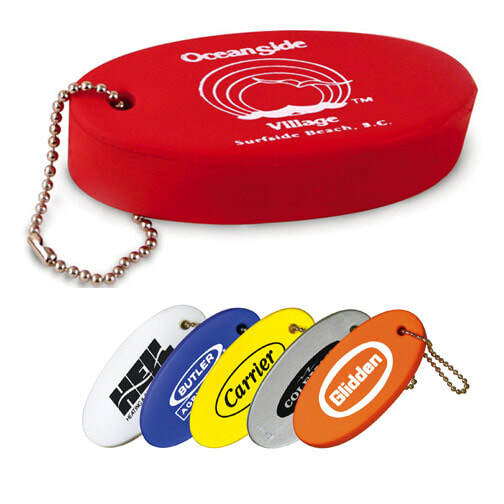 Floating key chains include a stainless steel beaded chain and large imprint area for your ad copy or logo. Production Time: 9 working days, plus UPS shipping time. Note: No two floating key are exactly the same. The color and density of the polyurethane can vary. Although we use the best imprinting method in the industry, a certain amount of distortion is unavoidable. Bold lettering and logos print better than lines that are thin or small logos.